A ketogenic diet is one that is high in fat, moderate in protein, and very low in carbohydrate. Carbs should be less than 50 grams overall (or less if you can), but closer to 20 grams once you subtract out fiber. My macros on a typical day are 70% fat, 20% protein, and 10% carb. The carbs come from the fiber and little sugar in vegetable and nut/seed sources, any carb found naturally in meat products such as eggs, and a tiny bit of lactose still in the full fat dairy such as heavy cream, cream cheese, and sour cream. On days I consume little vegetables my macros are close to 75/20/5. The term “low carb” on the other hand can really mean anything less than the Standard American Diet (“SAD”), which averages 300 grams a day of carbs. So one might call 150 grams a day of carbs “low carb” but that is not ketogenic. Ketogenic is very low carb, generally 20 grams of net carbs (total carbs – fiber). The Ketogenic diet is also NOT the Atkins diet. Atkins is “low carb” and “high protein” but keto is “VERY low carb, and moderate protein”. They are very different, and you’ll get different results on each. A ketogenic diet done correctly focuses on eating REAL food from natural sources. 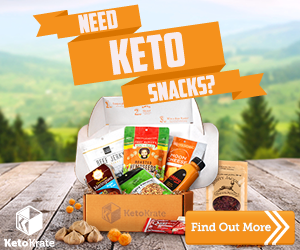 Keto focuses on avoiding anything processed, using organic ingredients whenever possible, and getting animal foods where the animals were in more natural environments and fed a natural diet. Keto is not “atkins bars” and atkins frozen meals, and anything else you might think of when you hear “low carb”. That junk is still loaded with wheat and other stuff your body doesn’t want. Keto is NOT high protein. It’s moderate. Keto is no grains or starches (wheat, rice, cereal, pasta, oats, etc), no sugar (or any of the many sugar aliases), no beans/legumes, no starchy/root vegetables (like potatoes), no man-made vegetable oils (such as soybean, corn, canola/rapeseed, etc) and no fruit (except occasional berries). Fruits that are generally categorized as vegetables in the culinary world (like avocado, zucchini, eggplant, squash, tomato, etc) are okay to eat. Keto also focuses on bringing back your Omega 3 to Omega 6 ratio back to 1:1. The Standard American Diet has a ratio of about 1:20, which is highly inflammatory. Keto focuses on keeping insulin low, and increasing insulin sensitivity (or reversing insulin resistance). 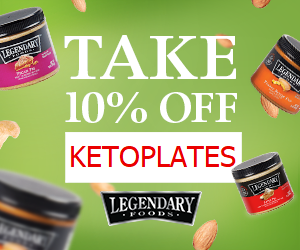 Keto is low-glycemic and eliminates blood sugar spikes. But won’t all this fat clog your arteries? No. Sugar does. The hypothesis from the Ancel Keys era that saturated fats causes heart disease was never proven and has only since then been dis-proven over and over. Watch this clip from FatHead on youtube for a quick summary of this, or watch the longer clip here. How much protein is moderate? I follow Dr. Phinney and Dr. Volek’s recommendation: Eat .6 to 1 x the amount of lean body mass in pounds (which means your weight minus the weight of fat on your body). If I weigh 140 pounds, but my lean mass is 110, then I will aim to eat a range of 66g to 110g of protein each day (Just take .6×110 and 1×110 to get the range). If you are athletic, try to stay on the upper side of that formula. But honestly… don’t worry about this so much. I find that simply eating keto food and eating when I am hungry I will naturally fall into my protein range every day, without trying. Maybe you should track in the beginning, but tracking and being crazy about the numbers forever will only make this lifestyle difficult and potentially cause you to go back to something terrible like a low-fat calorie-reduced sad diet. Don’t obsess over numbers. Just eat keto food. Athletes worried about “losing muscle”? You can visit my About Me page to see my stats – I have plenty of muscle, and my PRs go up all the time. So how do I know my lean body mass? To find this you need to know your body fat percentage. If you weigh 200 pounds, and your body fat is 40%, then that means you body fat weight is 80 pounds (I got that by multiplying 200 pounds by .4). This would mean your lean body mass is 120 pounds (I got that by subtracting 80 fat pounds from 200 total pounds). The best thing to do is go somewhere with a Bod Pod or a Dexa Scan. Some Nutritional stores even have a machine called “In Body” which can tell you your body fat and lean body mass. There are home scales and devices that can try to tell you your body fat percent, but those are in their infantry stages of technology and are not very accurate currently. If a scan is not available, you just just google some images for visually estimating body fat percentage. This is a good one: View Body Fat image here. A macro is a macronutrient. There are 3 (well 4, alcohol is one) main macronutrients: Fat, Carbohydrates, and Protein. You want to eat 70-80% of your total calories from fat, 20-25% from protein, and 5-10% from carbs. The easiest way to do this is to install a food tracker such as MyFitnessPal and track for the first few weeks until you get the hang of it. Apps like this show you your percentage breakdown. If you want to see my food, you can visit my food diary and/or friend my on MyFitnessPal here. Eat within your moderate protein range (explained above). If you go a little over or under one day, who cares. It’s fine. Just try to stay within the range most days. Eat less than 20g of net carbs a day (carbs minus fiber grams from nuts, seeds, and veggies). If you accidentally eat 21g of net carbs you’ll be okay. Again, just try to stay under 20 most days. Now don’t take this to mean you can go off and do 40g net carbs… you’ll probably be knocked out of ketosis if you do this. Of all the macronutrients, this is the one you should focus on the most. Count your carbs. If you have 0 carbs, that’s totally okay. Fill the rest of your food up with fat… honestly however much you want. Your body won’t let you go too crazy because you will get full quickly. There is no fat goal you have to meet. Fat is used to fill you up and satiate you. Stop eating when you’re full. For each meal if you just eat meat or eggs, cooked in fat, with a side of a low-carb veggie cooked in and topped with fat, you’ll end up doing well. Anything I post on this site is keto-approved. If you want a more detailed answer, this post from ruled.me is excellent. Ketosis is when your body switches from burning glucose (by eating carbs, sugar, or way too much protein), to burning fat. This produces ketones into the body which are then used as fuel. Nutritional ketosis is extremely healthy. But won’t I get ketoacidosis? No. Ketoacidosis is a state in which you have BOTH high blood sugar levels and high ketones. Ketones cannot be produced if you are in a sugar burning state. If you are in ketosis (producing ketones) then it means you don’t have high blood sugar. The only people at risk for ketoacidosis are those who are Type 1 Diabetic. These people should do more research before beginning on a ketogenic diet. Ketosis and ketones do not equal ketoacidosis. Just because two words sound similar does not mean they are similar. The easiest and cheapest way to know you’re in ketosis is to get some urine test strips. I like this brand specifically because they have a lot of different color levels and are pretty cheap. 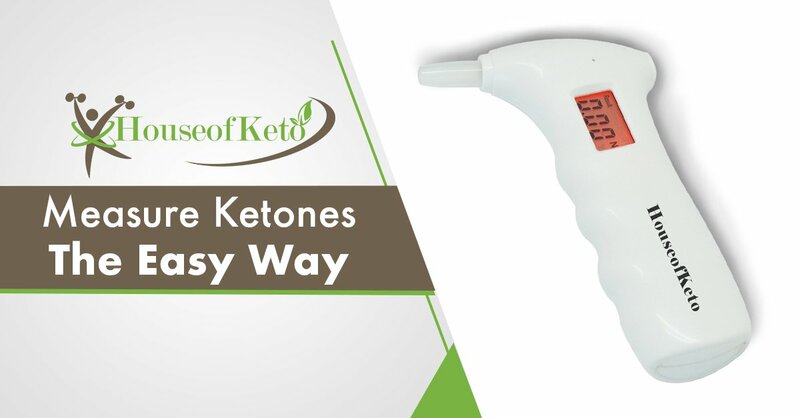 However, be do aware that the longer you are in ketosis, the more efficient your body becomes at producing the amount of ketones your body needs, which means less will spill over into your urine. This means you can get a false negative result. If you have been fat adapted a long time you may no longer show up pink. However this is a great tool for those starting out, or those who go in and out of ketosis. The more accurate way is to use a blood meter. 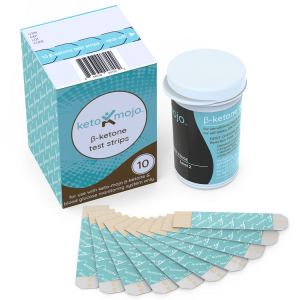 These use test strips and take a tiny blood sample to get an accurate reading of both ketones and glucose. I like the Keto Mojo meter. You can try it here: http://bestketonetest.com/trynow. I like this brand because it also has really cheap test strips, as opposed to the other brands out there which charge an arm and a leg for test strips. The third way is by measuring ketones in your breath. 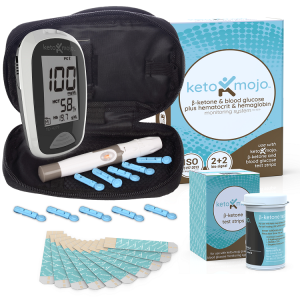 There are not a lot of these on the market due to it being newer technology, however, I’ve found one that I like called House of Keto Monitor. But my brain needs glucose! Technically correct, but not very much. Your body is amazing. If it needs sugar (glucose), it will make it from protein in a process called gluconeogenesis. Guess what – your body was meant to survive and it has processes for doing so. There is no such thing as an essential carbohydrate. To add to this, the brain is the only part of your body that needs any glucose to run, but only a small amount and only part of it. The brain still mostly PREFERS ketones (which is why you are actually born in ketosis)! You’ll hear otherwise, but go read books, articles, and studies and come to your own conclusion. My brain works quite well and I haven’t had carbs in years, and I’m not dead or brain foggy. Won’t you get nutrient deficiencies from not eating fruit or carbs? No. Every essential nutrient you find in fruit or any carb food can be found in meat, veggies, eggs, and nuts and seeds. In fact, did you know that eating grains with food actually hinders your body’s ability to absorb any nutrients? So that “nutrient packed” cereal bar you eat? Your body isn’t absorbing any good out of it. Here are some popular “but I need carbs for…” nutrients and my response…. Calcium. You might think that you have to drink milk or eat sugared yogurt to get this, but seafood, almonds and green leafy vegetables are all actually rich in calcium. Vitamin C. Commonly associated with citrus fruits, this nutrient is actually found in bell peppers, dark leafy veggies such as kale, broccoli, strawberries (which are keto approved in small quantities), and tomatoes. In fact, broccoli has more vitamin C than an orange. Potassium. No. You don’t need bananas every day. Bananas are high in sugar and will spike both your insulin and blood sugar, causing almost every calorie of the banana to be stored in your love handles. Keto-approved sources of potassium include avocados, spinach, tomato sauce, beet greens, green beans, clams, fish, almonds, swiss chard, kale, mushrooms, fennel, brussels sprouts, water cress, endive, cauliflower, celery, and winter squash. Whole grains. Not a nutrient! There is no such thing as an essential carbohydrate. Your body is literally built out of fat and protein, which is why only fat and protein are essential for consumption. This slogan was invented by BigFood companies who use ingredients subsidized by the government. What’s even more noteworthy is that a single Egg contains every single vitamin the human body needs, with the exception of Vitamin C. This means eat the yolks! That’s where all the nutrients are. No sad “egg whites” on this lifestyle! Is a ketogenic diet actually sustainable? It is, but you have to get through the adaptation stage. During the first 1-4 weeks your body will go through carb-withdrawal and will pitch a fit. This is known as the “Keto flu.” Your body has to build up the enzymes to break down fat efficiently since that system has been suppressed by constantly feeding it the other fuel source of glucose (carbs). You will also be releasing a lot of water, and with it your electrolytes. Eating extra pink salt and taking magnesium and potassium supplements will help with the transition. You will then become “Fat adapted” and turning down carbs actually becomes easy (this being said by a previous carboholic), even during holidays or celebrations! You will have high energy, mental clarity, and weight will naturally fall off. These benefits help people stay ketogenic for a lifetime. Why should I choose a ketogenic lifestyle? A ketogenic diet is not just about weight loss. In fact, weight loss is just a side effect of keto. Your body wants to be healthy. Unfortunately it’s constantly defending itself against the inflammation caused by sugar and grain consumption, as well as processed oils (such as soybean, corn and canola). When you eat ketogenic, your body can do what it naturally needs to do to become healthy. I can go into much more detail here, but you should probably just read one of the books I reference at the bottom. Won’t I gain all the weight back when I stop eating keto? If you make a change in your eating habits which causes weight loss, then if you go back to eating the way that made you sick and fat in the first place, then naturally you will put the weight back on. This has nothing to do with Keto specifically. You will gain weight by eating in a manner that got you fat to begin with if you go back to that. That is why Keto is a lifestyle, not a diet. Can I eat ketogenic “sometimes”? That’s a really bad idea. You’re either all in, or you’re all out. If you eat ketogenic in combination with sugar and carbs, that is a recipe for weight gain amongst other health problems. Get your mind right. You don’t need to cheat. As I am trying to illustrate on my site, almost any comfort food can be ketofied. If you don’t sacrifice for what you want, then what you want becomes the sacrifice. Choose your reason for going ketogenic, and ask yourself if that brownie is worth not having that, and then go make yourself a keto brownie instead. If you are following a ketogenic diet to suppress metabolic diseases such as type 2 diabetes, then ask yourself if tasting the junk in front of you is worth sacrificing your road to recovery. Isn’t low carb just a fad diet? Read this post. However, I would avoid these as much as possible. Keto treats should be TREATS, not daily or even weekly staples. Especially avoid these during keto-adaptation stage (at least several weeks). What keto food can I eat while traveling, or if I’m going to a party where I’m not sure if there will be Keto food? Read this post here. There are plenty of options available. It’s easy to stay keto if you actually try or plan ahead. I’m sold on Keto. But what about my pets? What should I feed my cats or dogs? Read this post here for more info. There are a few brands that I’ve found after a lot of heavy research and comparing ingredients, all of which are listed in my linked post. If you love your pets, feed them high quality food. Cats and dogs are also not meant to eat carbs/grains/sugar/man-made inflammatory oils. Where do I find out detailed info about the Ketogenic Diet? There is a plethora of information out there, and so much more you can learn. What I’ve said here doesn’t even cover the basics of what you can learn on ketogenic diets by reading.